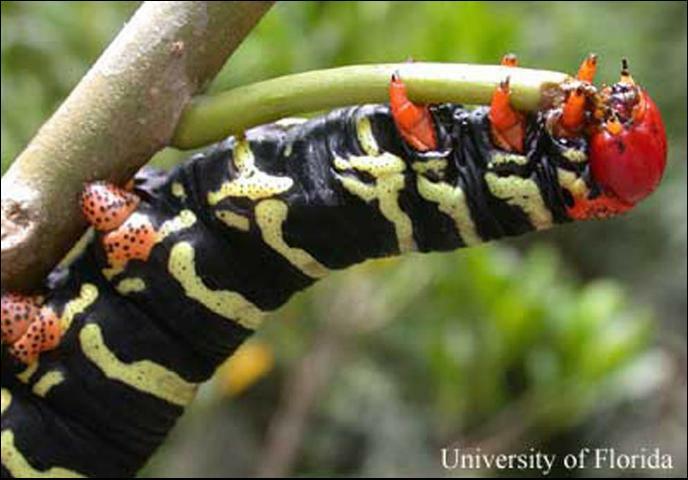 I believe your caterpillar is the Frangipani hornworm, Pseudosphinx tetrio. It is a common moth in the American tropics and subtropics although can occasionally be found in southern parts of Florida. The adult moths are mostly a drab grey coloration and are a stark contrast to their colorful larvae. 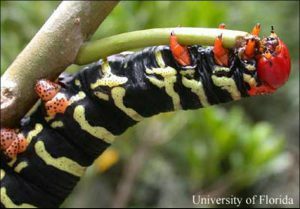 These larvae are conspicuous, large caterpillars often occurring in gardens feeding on frangipani and other members of the dogbane family (Apocynaceae). The caterpillar can grow up to 6 inches in length. The caterpillar is black with yellow stripes and it has a red-orange head. The unique color combination of the caterpillar is aposematic which means the colors warn any potential predator the caterpillar is toxic.